This article is related to the page My Icons. The theological and philosophical background for my understanding of Icons, is explained in my online book Philosophical Counseling with Tolkien. Currently I´m working on partly handmade Icons with six themes on wood from Beech and Linden tree, and a Sûnyatâ Sutra written on the back. In this article I will give a description of how the Icons can be used in connection with my teaching, as well as my personal interpretation of the six classical themes: The Virgin and Child, Christ the Merciful, The Transfiguration, The Crucifixion, The Resurrection, and Archangel Michael. Classical icon motifs are repeated over and over again with small variations. Making an icon is a thousand-year old craft, where a tradition-bound reproduction in a tight and harmonious symbolic order, creates a universal space. The persons in a Byzantine icon are flat with long unnatural proportions, typically frontal, symmetrical and static. They are without shadows. Often is used what is called a hierarchical perspective, where the most important persons are pictured as the largest. The figures are transcendent beings - not humanized - and with focus on the portrait, especially the eyes as the expression of the personality. The faces are small with large almond-shaped eyes that symbolize God's presence. The mouths are small and with closed lips as a symbol of meditative, silent speech. The brows are vaulted, and the long and narrow noses catch the fragrance of the "spiritual aspect". The ears designate that the icon listens to the person of prayer and hears the word of the Lord. The background of the icon motif is usually uniform, without atmosphere, usually a gold background, which is understood as the divine light. The motif can also be placed in an architectural frame or in a landscape, possibly with a specific topographical symbolism - for example, places where Jesus was walking. The schematized environments appear in what is called a reverse perspective, where the lines originate from a point in the foreground of the image-space outside the image plane - or conversely, you could say that they seem to meet in a point outside the icon in the heart of the observer. With the observer in the focus of the perspective, it seems at the same time that the icon is observing the one that observes the icon. The icon is embracing the observer in all his or her humanity. This creates an indefinable, mutual contact. Now we clearly have the element of the spiritual practice. Icons are made for spiritual practice, and they are made by people with a high spiritual training. The reverse perspective namely illuminates the concept of bidirectional consciousness. The actual spontaneous appearance and stream of heart-feelings is the crucial indication, that your training-intention has become existential reality. Heart-feelings are in other words not an entrance into the Now, as Hara is. The heart-feelings are coming from the Now, or rather, from the actual Source, because the consciousness is open. When the consciousness is open it is de-focused, and this is again connected with, that it both is directed into yourself, and out towards the world. It has become spacious, all-inclusive. And this spaciousness is the same as silence. And it is in this wordless silence that the great wonder arises; the wonder in which you ask the philosophical questions in a meditative-existential way. In connection with the Heartmeditation you can in this way talk about wordless prayer. The wordless prayer is a philosophical questioning after the source of the heartfeelings. In the heartfeeling you open yourself in wonder and silence, not only out towards the heartfeeling and it´s object, but also in towards the source of the heartfeeling. You are therefore not only wordless open in the direction the heartfeeling flows (towards the object, the suffering person, the love-partner, God), but also wordless open towards the Source from where the heartfeeling is coming. It can all briefly be described as silence. You can´t understand it by analysing or thinking. Dont do that! You have to experience it. The Icon of Christ the Merciful symbolizes the life and teaching of Jesus Christ. It is not a coincidence when I claim that Jesus preached idleness. The magnet of attraction, which the ego is controlled by – (the ego´s identity with the material world: instincts, sexuality, emotions, desire, experiences, collective ideals, ownership, personal power) – will in a spiritual practice gradually begin to lose its attraction. Investments in the material world´s ups and downs, its demands, temptations and dramas, become undramatized, uninteresting, even meaningless, in relation to the consciousness´ opening direction in towards its spiritual essence: the now, the Wholeness, life itself, and finally: the eternal Otherness, from where the Good, the True and the Beautiful is streaming as grace and forgiveness (see my page Links to Idlers). Meditation, or wordless prayer, stops the intentionality, and directs the mind into its source, namely consciousness itself, which is one and the same as reality and Wholeness. You could also say that meditation changes the consciousness from being one-directional to being bidirectional. Bidirectional consciousness means that the consciousness both is directed towards its form and its content. It is being open to the form of consciousness, aware of both magnetic poles in the field of subject-object experience. I have also called this the Wholeness of the Observer and the Observed. 6) The Wholeness of the Observer and the Observed (the mystical experience as shown in The Transfiguration icon. The Transfiguration can also be seen as the form of consciousness. It is, in my interpretation, what is referred to with titles such as Christ, or Son of God. The Transfiguration shows the eternal continuum of consciousness, a line of enlightened consciousness from Moses and Elijah to Jesus, and how the work of these Old Testament prophets is continued and refined with Jesus Christ. I have explained the form of consciousness in Philosophical Counseling with Tolkien, Metaphysics B; Ontology, Part 1: The Problem of Mind). Along the path towards the enlightened form of consciousness, the detachment to the material world is slowly released. Let me explain the concept of attachment. The Ego, the feeling of identity, is deposited around the source of awareness. In the cinema you can look at the screen, and lose yourself in identification with the action. And you can turn around, and look into the light-source of the projector. In the mind the projector is hidden in the Ego, hidden in the thinking, hidden in the awareness. In order to discover and break the identification with the samsarical producer of the mind, the subject must discover the hidden source in the awareness or in the innermost of consciousness. It happens by neutralizing the Ego´s, or the thinking´s, functions. This happens through Hara awareness. 2) Investigating the shadow (ignorance, the unconscious, the painbody, the cause of suffering, your own dark side, the ego). This aspect I call Learning to see with the Heart, or Heartmeditation (Tonglen) – see my articles The emotional painbody and why psychotherapy can´t heal it, and Suffering as an entrance to the source (in these two articles I show that spiritual practice only can progress with the help of the divine, symbolized by Icons). In Buddhism the belly has always been understood as the center and inner ground of human´s being. The lack of visible exterior signs of “progress” in many traditional Buddhist sculptures is a reflection of a value system in which interest in the products of the head and the processes of the heart were subordinated to a concentration on man´s inner being. Modern Western materialism is based on the values of Doing and Having, of achievement and ful-fillment – filling the belly, answering the mind´s questions and filling it with knowledge, satisfying the heart´s desires. In short: it is the philosophy of Becoming (The Mythology of Authenticity). And yet it is precisely this materialism that can leave people feeling empty rather than fulfilled. Becoming has no Being. Western philosophy is in essence the philosophy of Becoming, Eastern philosophy (and Western mysticism) is a philosophy of Being. So, there is an essential truth in the Buddhist practice of emptying, one which is in perfect accord with the creative impulse of the West, and has nothing to do with the attainment of a state of pure emptiness or Nirvana. This is the understanding that it is only if we are able to actively clear an empty space in our head, heart and hara – our thoughts, feelings, impulses and intuitions – do we become open ourselves to receive genuinely new thoughts, sense genuinely new feelings, and let genuinely new intuitions and impulses germinate and incubate within us. This was Meister Eckhart´s understanding of the Virgin conception. The purpose of creating a “virgin” soul is to become permanently fruitful in soul, and in this way to become host to a new sense of self – one links to Being or “God”. For God is essentially “bearing”. Eckhart´s thinking was a “thinking of the belly”, understood in a fundamentally feminine way through Christian symbolism – as the pregnant “soul-womb” of the spirit. 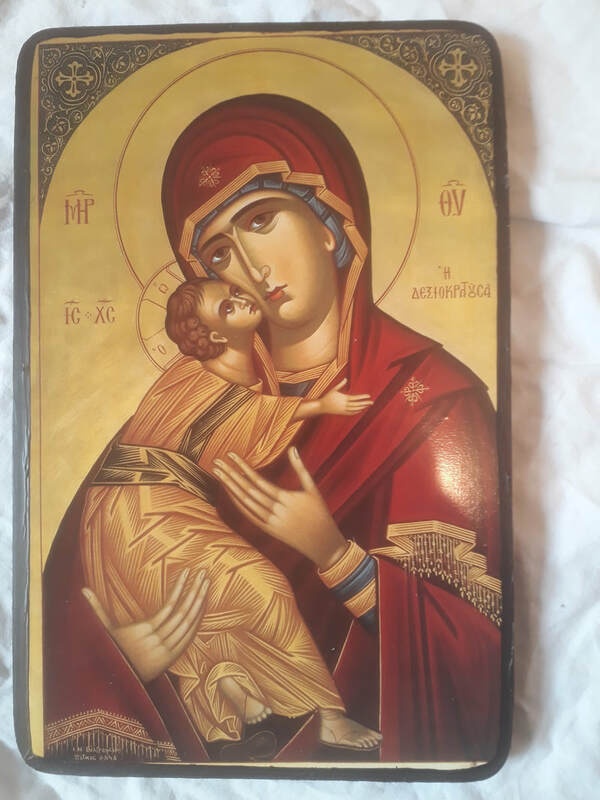 This is my main thought behind the Virgin and Child icon (Virgin Mary has many other meanings, for example an angelic meaning - again, see my book Philosophical Counseling with Tolkien, chapter 3, Philosophical Angelology. The Icon also symbolizes the important aspect of becoming like a child again, which I have written about in my concept of The Peter Pan Project. The Sûnyatâ Sutra written on the back of each Icon, functions as a short text for meditative reading, as well as a blessing. These functions are what creates the layers of the painbody. The source of awareness, the naked consciousness, is hidden because it has melted together with these four functions. They have become a kind of layers, and it is from these all your energetical cords are spreading. There is in other words no analysis in it. The whole proces is like a flower coming up from the earth, opening itself for the sun. The collective time is a very dangerous intermediate area, if you not are very trained in realization and compassion. I call it The Spiritual Twilight Zone. The collective time is the area where different kinds of paranormal (philosophical/religious) phenomena are beginning to occur in your daily life. It is especially the lack of understanding this area, that is due to my critique of the many incompetent spiritual teachers you see today in the New Age movement (see my articles Six Common Traits of New Age that Distort Spirituality, and The Matrix Conspiracy). If you don´t understand what to do, when these phenomena arise, it can end in a spiritual crisis (see my article Spiritual Crises as the Cause of Paranormal Phenomena). It is the area where demons hunt. Though you might have paranormal abilities, then you, spiritual seen, not necessarily are sufficiently awake on these areas, and therefore competent enough to guide other people spiritual. You´ll need to accept the pre-modern spiritual traditions, where they accept that man on a spiritual path needs external divine help. The process can therefore be aided by calling upon the Archangel Michael for help. Cutting cords can be difficult as we are sometimes blinded by fear or false memories of happiness. Asking for help from any of the archangels will aid you and provide you with guidance. However, asking the Archangel Michael is the recommended approach. You can use an Archangel Michael cord cutting prayer but this isn’t a set prayer. It’s a personal call for help that comes from deep within you. You may see websites claiming to have specific prayers to use but nobody can tell you how best to channel your connection. All traditional spiritual practices acknowledge the existence of both an outer divine source and an outer demonical source, both of which you can´t control. Therefore you must also discriminate between yourself and these sources. The Ego is in this way made transparent along with that original sin and negative karma are transformed and transfigured in the contact with the divine Source (God, Christ, the enlightened consciousness, the saints, spirit helpers etc.) And these two processes mutually fertilize each other. The most explicit example of this is the Crucifixion (also see my article Suffering as an Entrance to the Source, as well as my pop culture file The Passion of the Christ). Therefore I combine The Sword of Discrimination with the divine sword of the archangel Michael. Archangel Michael is traditionally thought to be who to call while cord cutting. He is an angel of protection and carries a sword of light. Traditionally, you would call on him to do the basic cutting for you. So, while sweeping your own sword of discrimination ask Michael to help you to cut all ties, cords, and contracts that are no longer of use for you (more about Hara Awareness and cord cutting in Philosophical Counseling with Tolkien, chapter 5, Epistemology; part 5: Hara – Rediscovering Existence). The Archangel Michael icon symbolizes all this, but also that there is a spiritual war between good and evil going, and that Archangel Michael is our protector here. Again, this is explained in the chapter on angelology. The Resurrection icon depicts that Christ finally won the battle with Satan. Back to the reverse perspective of Icons. Behind the motif, the perspective creates a spiritual sphere that extends and extends indefinitely with the heavens, and at the same time surprisingly draws what is on the other side closer to the observer. The origins of icons are therefore clearly the mystical experience, and the purpose is spiritual practice. The way the icon represents ideas and conceptions was not created by the icon painter, but by the early church writers (the church fathers) in the doctrine of the church. It was the task of the church fathers to determine the iconography, i.e. how the composition of the icon should be, the sacred figures should be made, etc. An iconographer therefore follows carefully elaborated prescriptions, and there is little room for artistic freedom. However, the mandatory is not absolute if you understand how to give expression for the universal messages that lie in tradition. What is important for a novice, however, is that the icon motif represents all that continues and has eternal validity. By repeating the old prototypes you simultaneously receives the ancient masters´ deep experience. In any icon motif there is a permanent element as well as a random and changeable element. The permanent element is what shows and expresses the doctrine of the Church - for example, the way the hand is blessing and the stars of Virgin Mary's gown are unchangeable. The random element is, for example, buildings, trees, and coat folds, and this can be changed according to the taste and talent of the icon painter. The permanent elements can never be changed, showing the church's beliefs. The main task of the iconic painter is – like the priest - to perform a ritual that, in a precise depiction of portraits and good deeds, reproduces the teachings of the Church. He must make the Icon readable, reliable and increase its recognizance and holiness in a symbolic order that leads to a spiritual state and the presence of the divine. Space, time and liturgy merge into a symbolic construction. The making of an Icon is a silent, spirited service, and the Icon is a preaching of silence. Time is transfigured into to a mystical life-experience, where eternity is lived in the now. Over time and place, a variety of more or less permanent ways have developed to depict the sacred persons and religious scenes. Gradually there were formed gatherings of these guidelines or manuals (Greek: Hermenia, Russian: Podlinki). The oldest podlinki originates from Russia, from the Caves of Kiev around the 12th century. The best known manual from Greece is from around 1730 and is written by the monk Dionysos of Fourna. When you talk about icons, you also talk about from where the icon originates. Is it Greek, Serbian, Romanian or Russian, is it Ethiopian, Coptic or Armenian? From the 1400s we talk about "icon schools", i.e. workshops in monasteries and royal palaces or even entire villages, where painters were ordained to paint icons and frescoes. Painting workshops had existed for a long time at Athos, Meteora and the Balkans, but now they spread throughout the orthodox church's field of influence; there were for example many Russian icon schools. New paint ways appeared, among others defined by local traditions and locally occurring color pigments. Iconography is similar to a formula language or system of adopted symbols and attributes where everything matters. Virgin Mary´s stars symbolize purity before, during and after Christ's birth. With the hands are expressed blessing, prayer, intercession, sorrow and other emotional feelings. For example, fluttering robes in a scene testify that the Holy Ghost is present and blows through the image. In some cases, several situations appear in the same icon, almost as a story line. This can be done because events are understood as timeless phenomena which are reflected in the reality of the individual. The situation takes place at once - before, now and in the future. The color symbolism is extremely important and a whole story in itself. The color world of icons is ambiguous. For example, Virgin Mary´s robe is red-purple or a deep earth-color, whereas her dress is blue, in order to symbolize that she is human, but carries the divine in her. The mysticism can´t be decoded in a few keywords, but here are some words for each color. Gold: is not a color, but symbolizes the divine, uncreated light, divine radiance. Red: the color of blood, sin and martyrdom. It also stands for life, passion, the earthly. Violet, purple (from red to a deep earth color): increased calmness, highest divine color on earth. Light blue: the heavenly, the transcendent. Dark blue: cosmos, the expression of the mystery of divine life. Green: youth, vitality, fertility, paradise hope, new beginning. Brown: the earthly, material cosmos. Black: The absence of light, death, the cave, the color of transformation as the expression of the mysterious state, before the spirit of life blows into man.